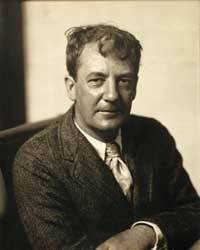 Sherwood Anderson was one of a large number of writers in revolt against both the subject matter and form of older stories. Many such writers reflected in their portrayal of characters the descriptions and theories of new psychology, which was causing people to view human motivation and behavior in a new light. Anderson and his contemporaries exhibited in their styles the plainness, simplicity, and directness characteristic of earlier experiments in prose by Gertrude Stein, an American ex-patriot living in Paris. Anderson's volume of interrelated short stories, Winesburg, Ohio (1919), marked a radical change in the American short story in content and style. The work, which opens with "The book of the Grotesque," portrays ordinary people psychologically warped by their desperately lonely lives in small-town America. Omitting the structure of traditional plot, which included ad climax, Anderson's stories appear rather formless, concentrating on little moments that bring life into sharp focus for the characters. Such moments, seen in "Sophistication," are rendered in a spare style that works a magic in evoking sympathy in a reader.